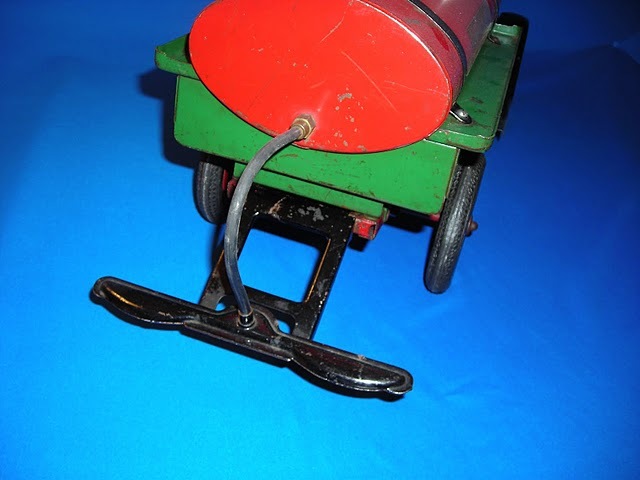 Sturditoy, the Pressed Metal Company, brought the introduction in 1926 of nine marvelous pressed steel toy trucks and a steam shovel from a company in Pawtucket, Rhode Island under the trade name "Sturditoy". 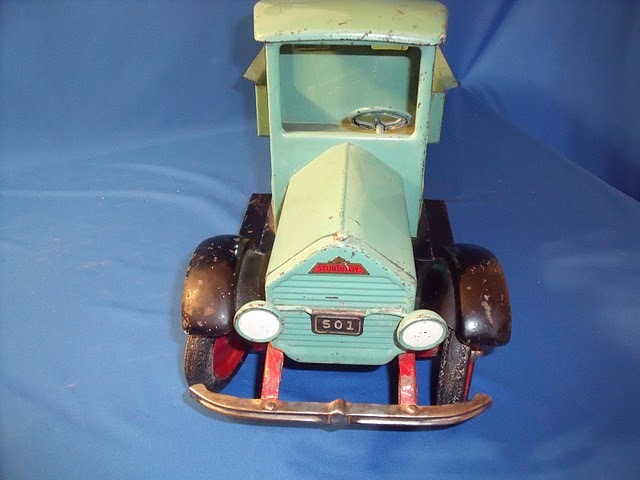 Manufactured by The Pressed Metal Company, these trucks featured solid disc wheels, hard rubber "Firestone" tires and heavy steel bumpers. 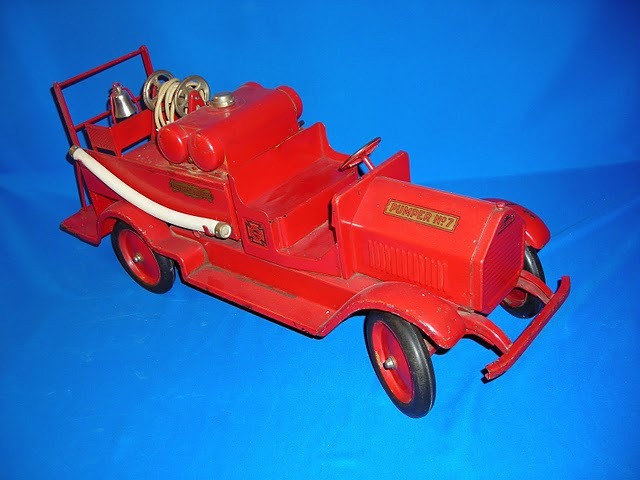 Sturditoys were advertised as "True Lines of Modern Motor Fire Apparatus and Modern Business Trucks" which duplicated real trucks found on the highways of America in 1926. 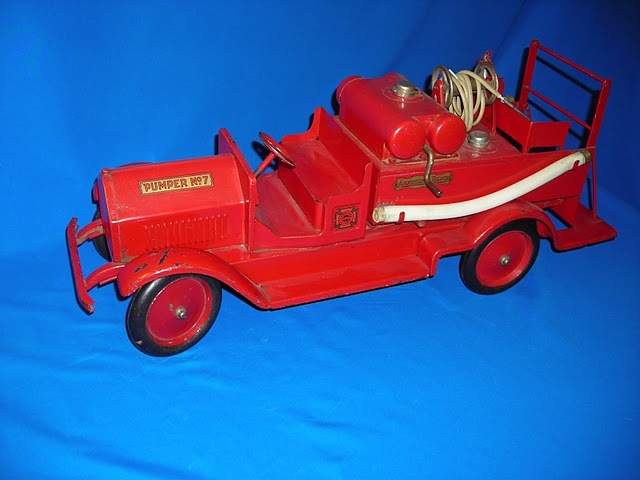 The most noted items produced that first year were the highly acclaimed "Pumper" and "Chemical Fire Auto Truck" and the "Water Auto Tower". 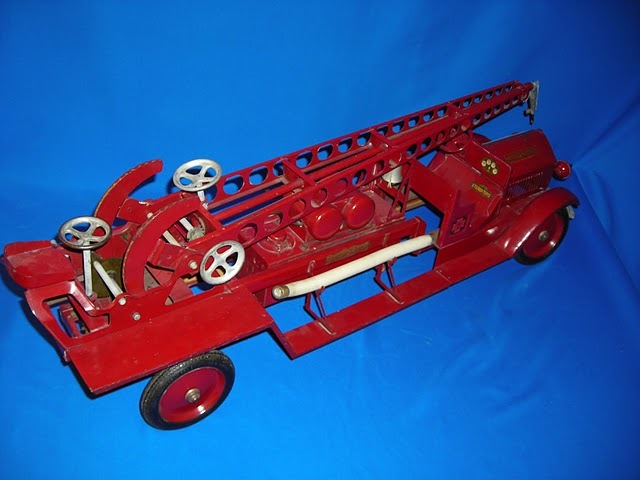 Each of these toy fire fighting vehicles were equipped with a real water tank and hand-operated pump which could propel a stream of water 25 feet. 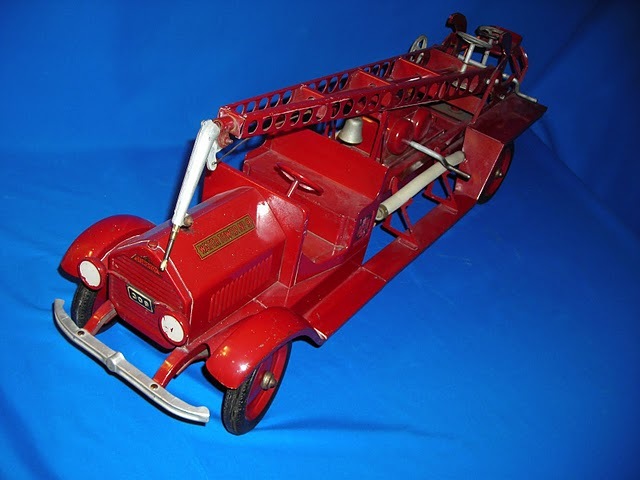 Both fire trucks were reported to be copies of American-LaFrance Company. 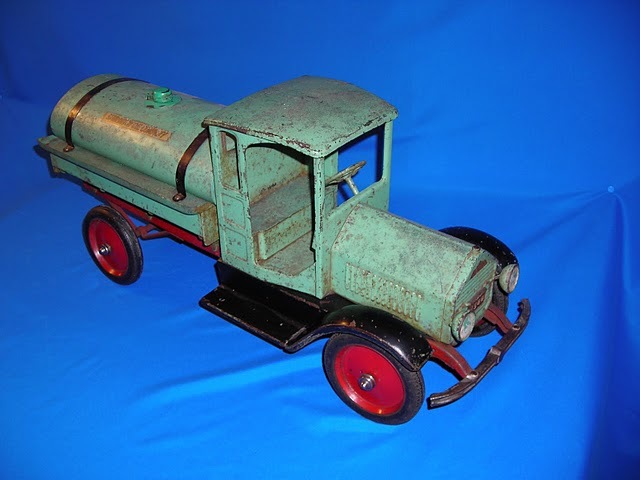 By the end of 1927, a total of 14 Sturditoy trucks and one steam shovel were being offered by The Pressed Metal Company. 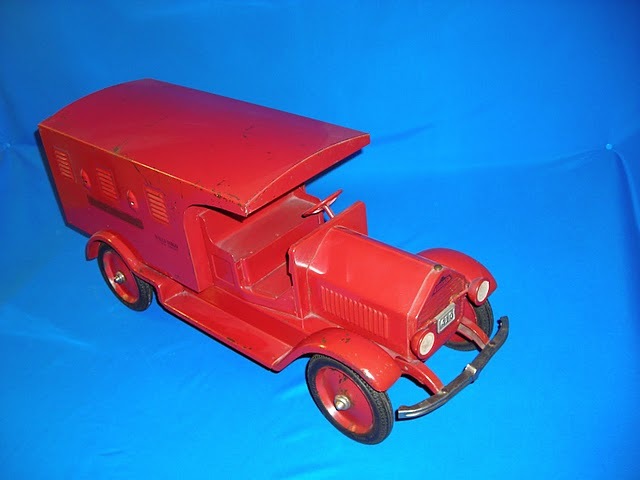 In 1929 the Sturditoy Company announced the addition of 5 new trucks, bringing the total to 25. 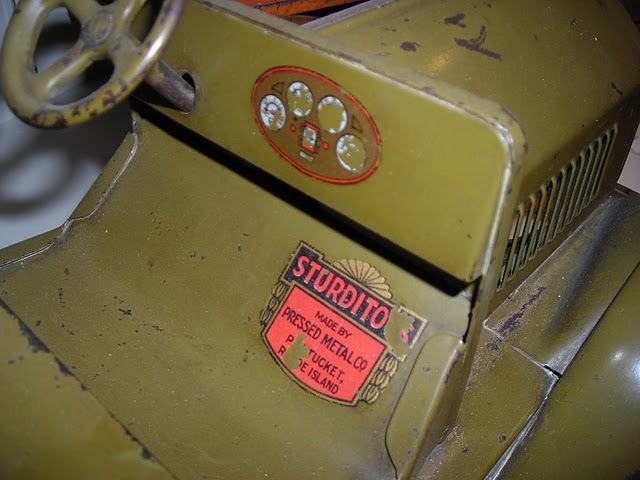 Sturditoys were committed to history in 1933 when they ceased to be produced. 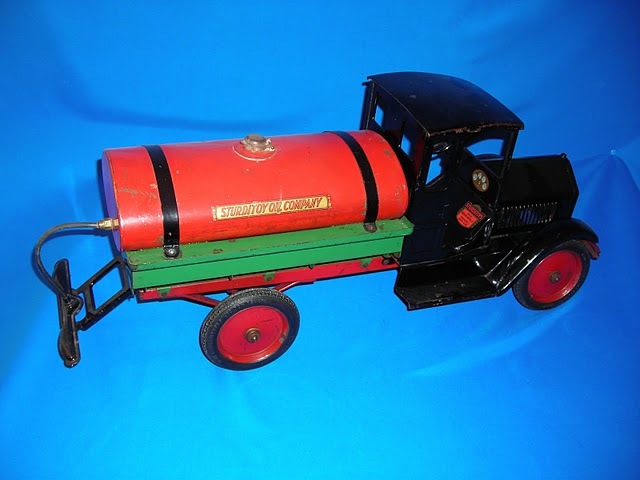 Sturditoy American Railway Express Truck 1926. Sturditoy American Railway Express Truck with decals; tires have no tread. Sturditoy American Railway Express Truck showing rear doors and latch. 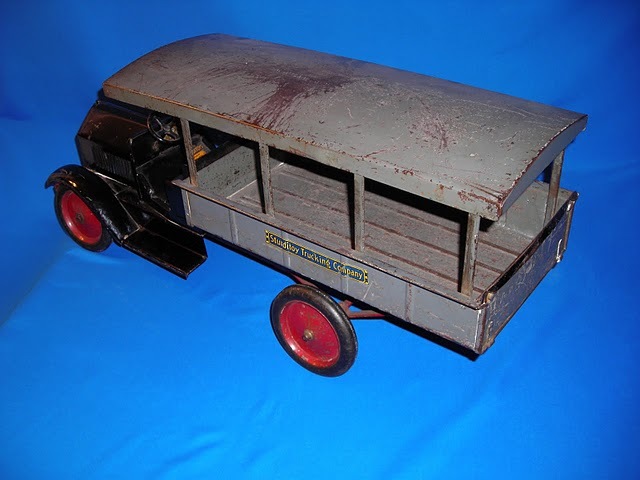 Sturditoy American Railway Express Truck 1929 with 2 screens. Sturditoy American Railway Express Truck with decals, tires have tread. 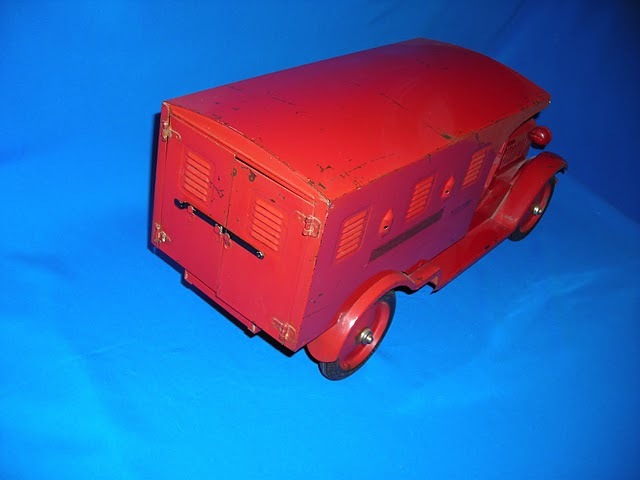 Sturditoy American Railway Express Truck with rear doors and latch. 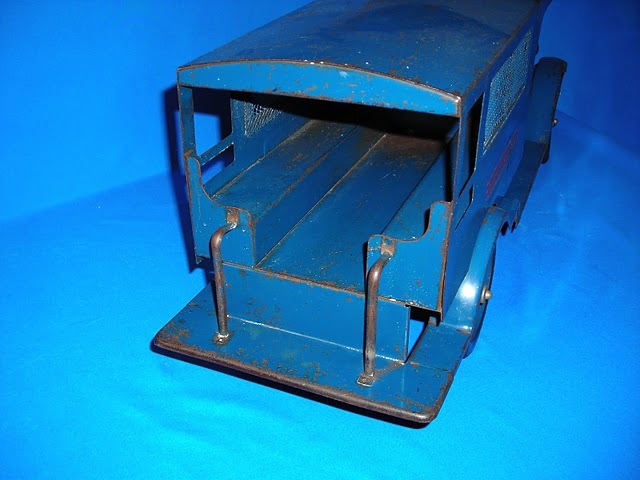 Sturditoy American Railway Express Trucks - headlight and non-headlight versions, license plate and non-plate versions; bumpers and tires are different as well. 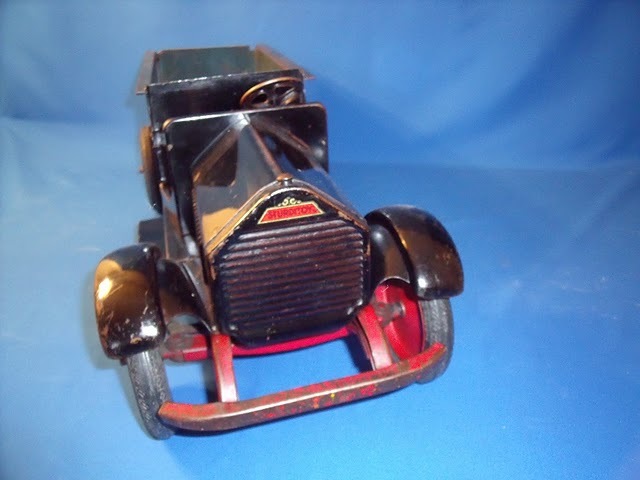 Sturditoy Armored Truck 1927 equipped with Stamped steel plated bumper and headlight bar, with 2 headlights and double disc steel wheels with rubber tires. Sturditoy Armored Truck with rear doors showing black metal latch to secure doors shut. 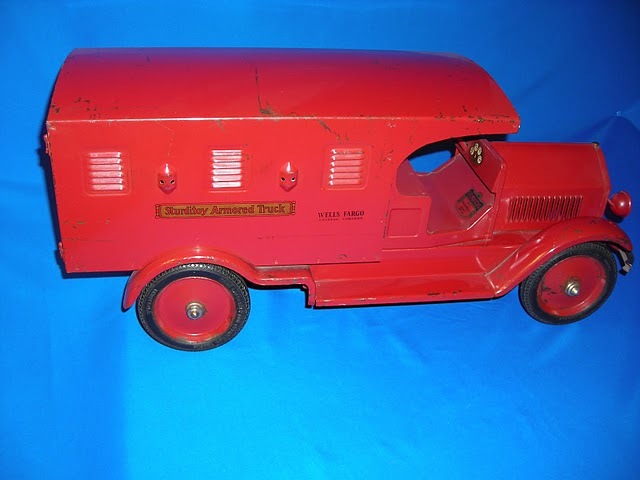 Sturditoy Armored Truck showing rubber stamped Wells Fargo on service body. 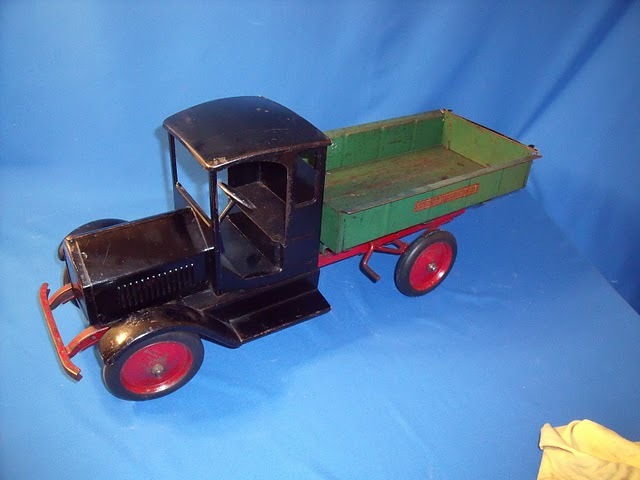 Sturditoy Dump Truck - low open cab, narrow body, with side crank. 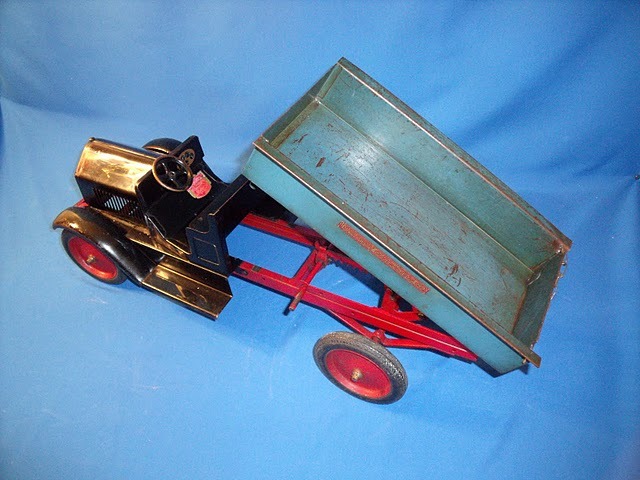 Sturditoy Dump Truck with bed raised. Sturditoy Dump Truck other side showing side of bed decal and dashboard and floor decals. 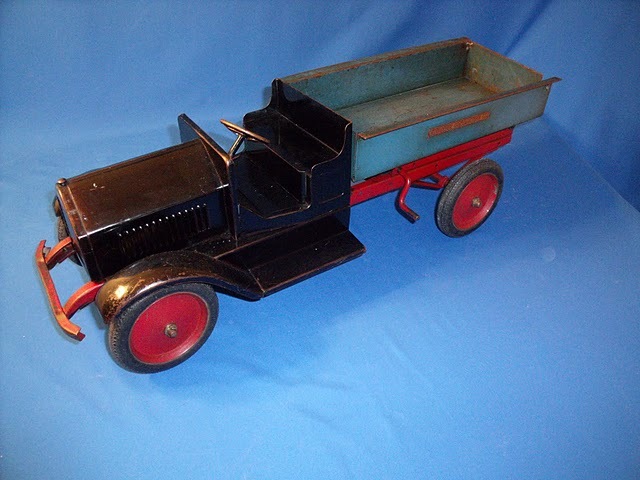 Sturditoy Dump Truck radiator with decal. 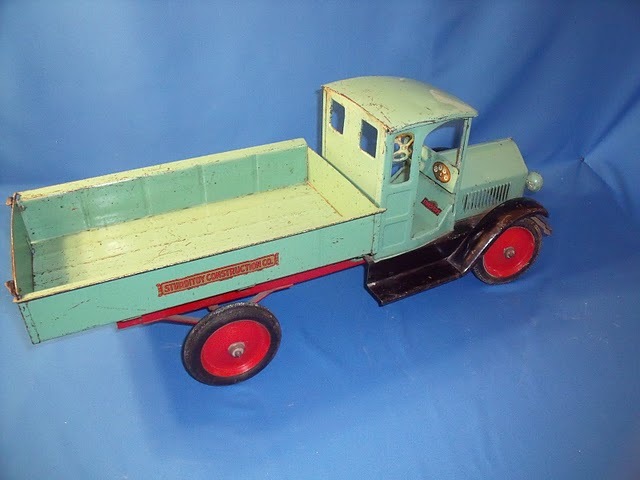 Sturditoy Dump Truck full cab version, light green. Sturditoy Dump Truck full cab version, other side showing body decal and plated bumper. 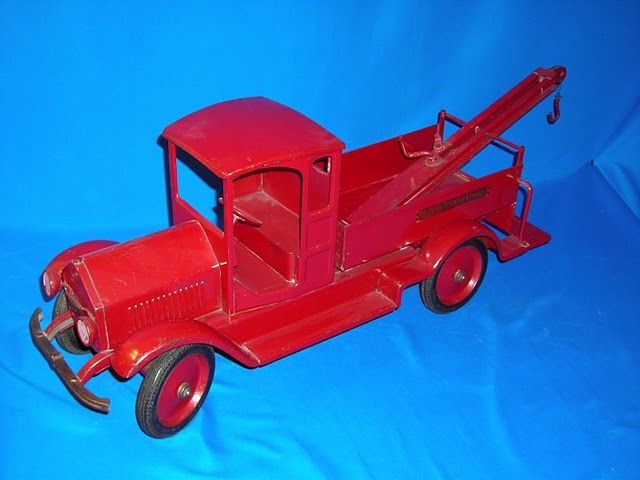 Sturditoy Dump Truck full cab version, bed raised with crank handle. Sturditoy Dump Truck full cab version, front view of headlight bar with 2 headlights and license plate number 501 and decal. 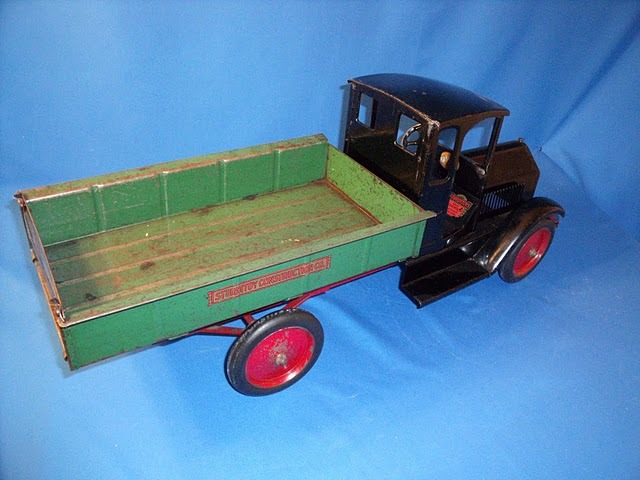 Sturditoy Dump Truck black cab and green service body. 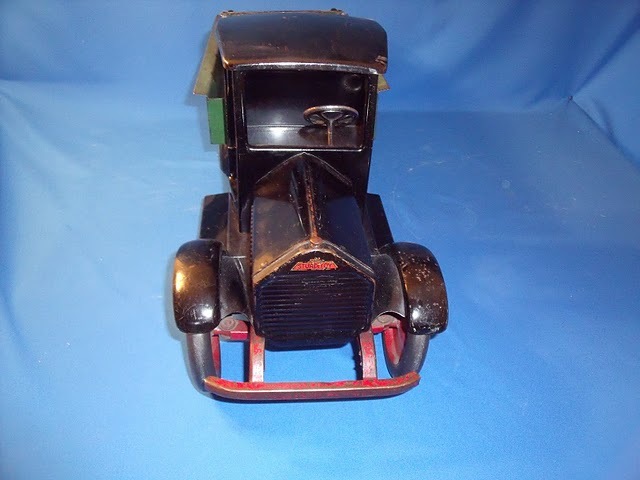 Sturditoy Dump Truck black cab other side showing hubcaps and decals. Sturditoy Dump Truck black cab front view, radiator decal, no headlights on this version and painted bumper. 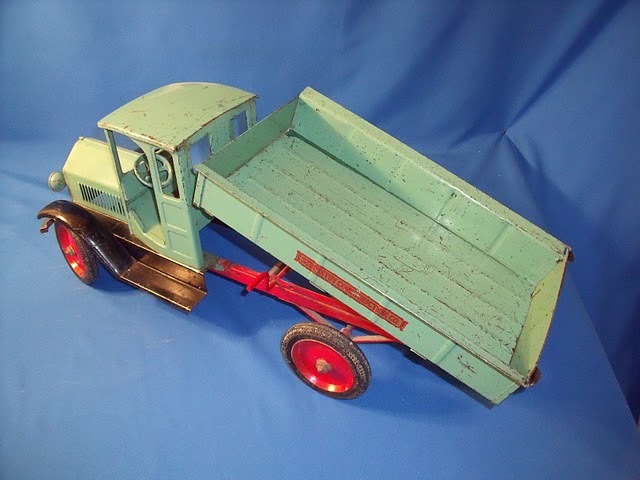 Sturditoy Dump Truck green version. 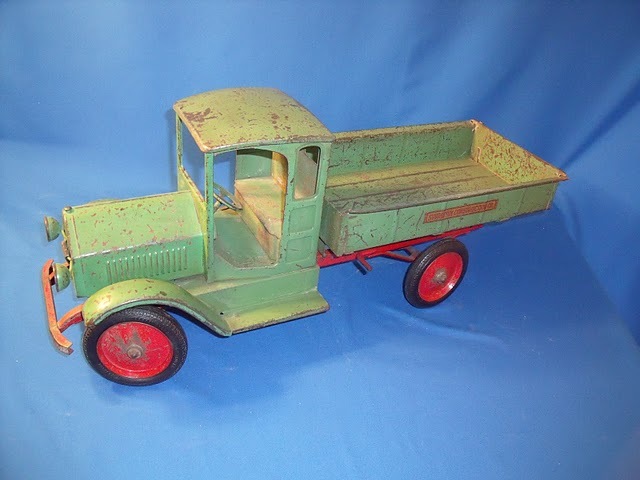 Sturditoy Dump Truck green version other side, side body decal, hubcaps and lights. 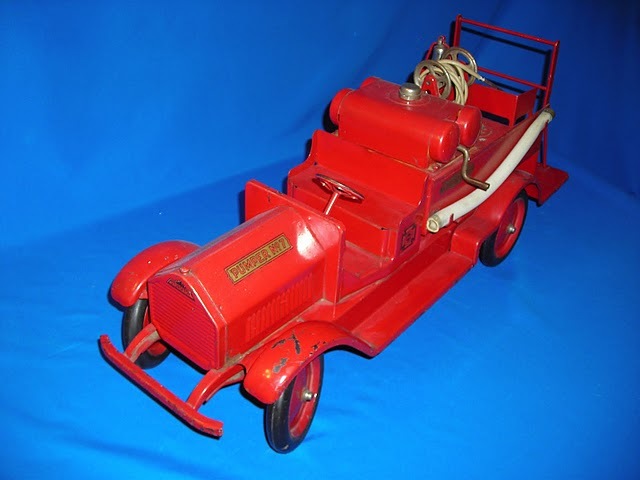 Sturditoy Pumper and Chemical Fire Auto: 1926. Non headlight version. 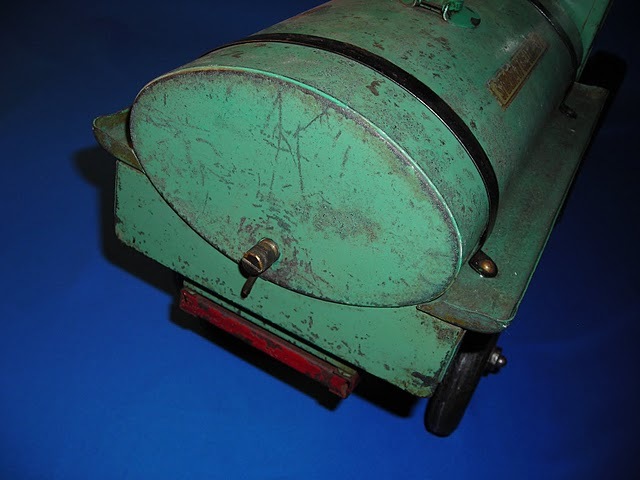 Also equipped with side mounted hoses. Painted bumped and double disc steel wheels. 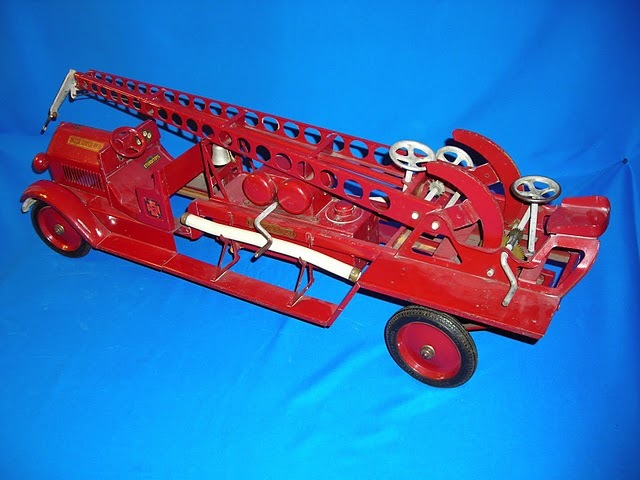 Sturditoy Pumper and Chemical Fire Truck with rear hose and nozzle and pumper crank. 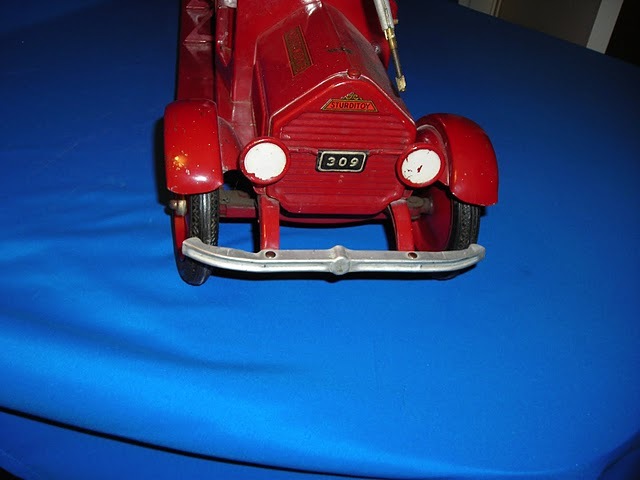 Sturditoy Pumper and Chemical Fire Truck with decals on hood, side of body and seat side as well as on floorboard and dashboard. 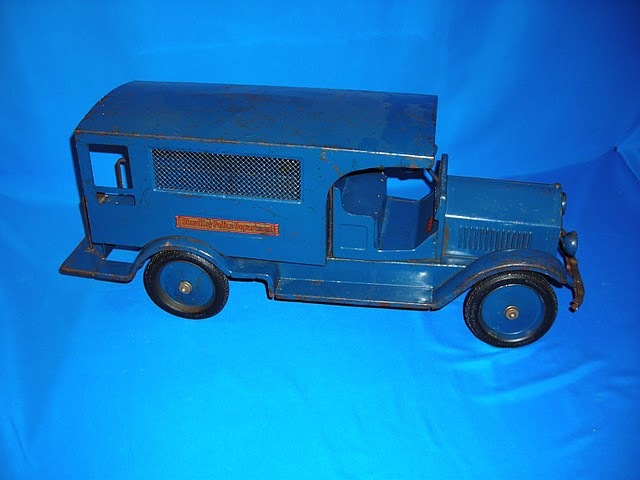 Sturditoy General Delivery Huckster Truck 1927. This version is without headlights. Sturditoy Huckster Truck Rear tailgate with black metal band that acts as a lever on the tailgate that hooks into rear so the load rides in a secure position. 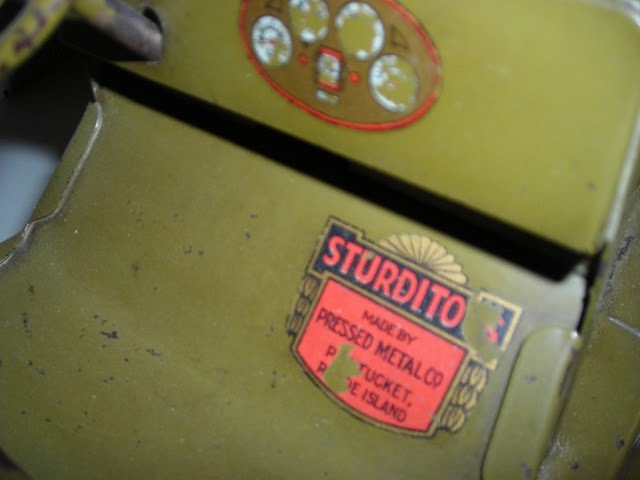 Sturditoy Huckster Truck showing tailgate in the opened position. 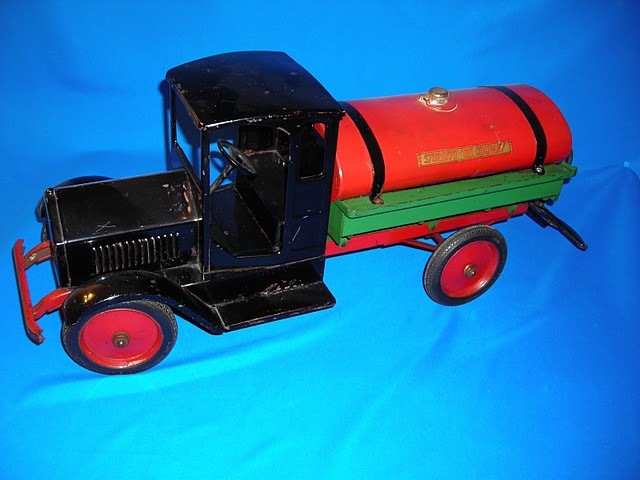 Sturditoy Oil Company Sprinkler Truck equipped with faucet and Sprinkler bar 1927. 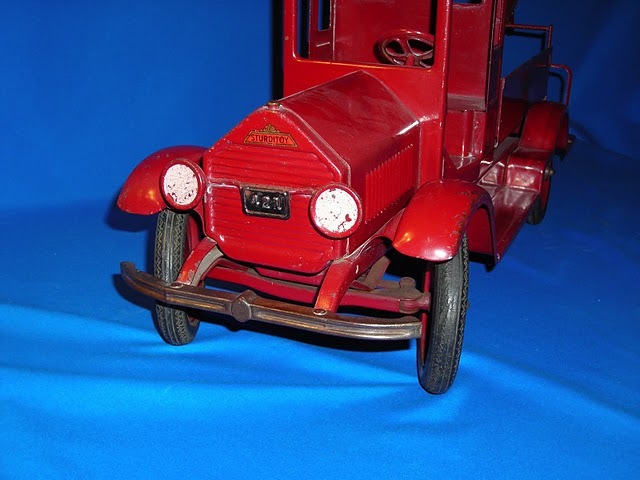 Sturditoy Oil Company Sprinkler Truck non-headlight version with Stamped steel plated bumper and double disc steel wheels with rubber tires. 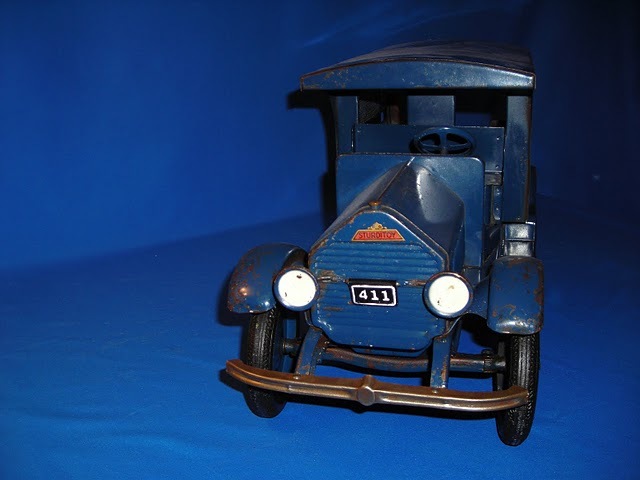 Sturditoy Oil Company Truck - this version is equipped with headlight bar, 2 headlights and license plate #544 and plated bumper. Sturditoy Oil Truck showing headlights, license plate and plated bumper. Sturditoy Oil Truck close-up of faucet on rear of the tank. Sturditoy Oil Company Truck showing Sprinkler bar and hose connected to the faucet. Sturditoy Police Patrol Truck with cut-out on rear side of panel and rear step. 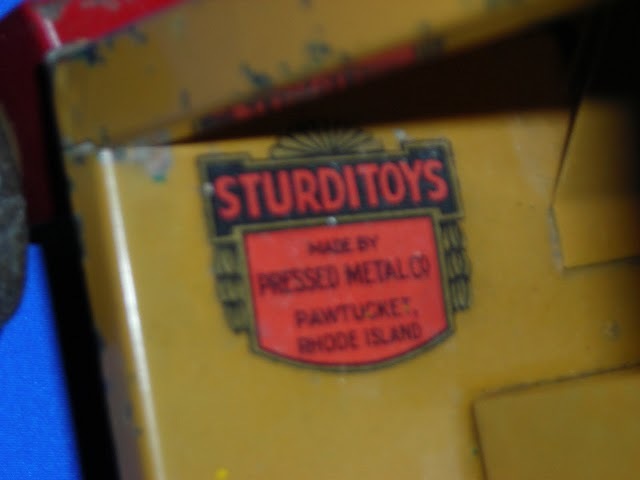 Sturditoy Police Patrol Truck showing factory decal error using 2 lines on this side of the toy. Sturditoy Police Patrol Truck showing factory decal error, screen window and hubcaps. Sturditoy Police Patrol Truck front view showing headlight bar, headlights and license plate (411), Plated bumper, decal on radiator, with treaded tires. Sturditoy Police Patrol Truck rear view showing rear long seats and service body with rear step. 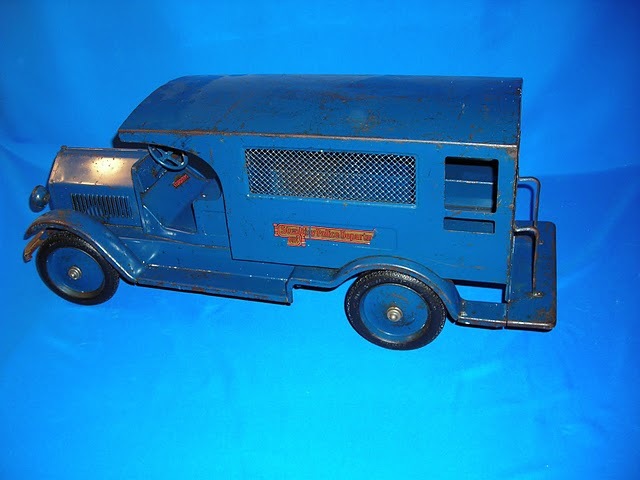 Sturditoy U.S. Mail Truck 1927 non treaded tires with 2 screens on both sides. Sturditoy U.S. Mail Truck with decals and screens on the back doors. 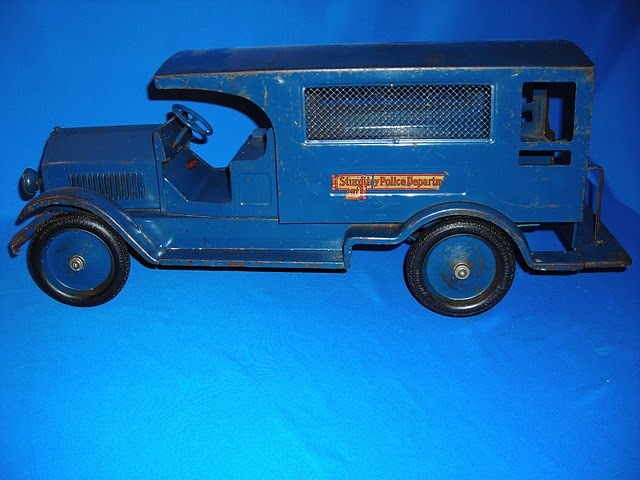 Sturditoy U.S. Mail Truck 1929 with treaded tires and headlights. 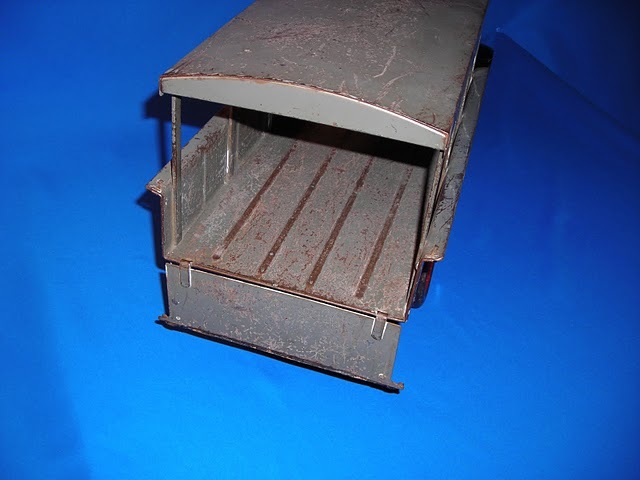 Sturditoy U.S. Mail Truck with solid back doors and decals. Sturditoy U.S. Mail Trucks one with headlights, license plate and treaded tires, and the other without. Sturditoy U.S. Mail Trucks with different back doors and latches that keep them closed. Sturditoy Water Tower Auto: 1927. Stamped steel painted bumper. White rubber hose mounted on each side of the service body. 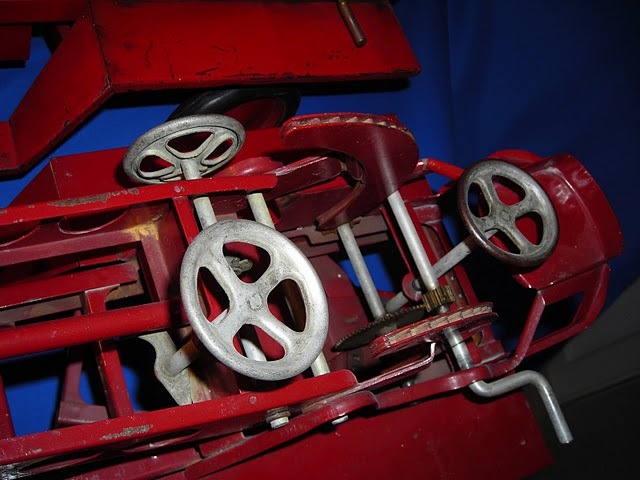 Front and rear steering. Sturditoy Water Tower Auto this version with headlight bar, 2 headlights and license plate number 309. Treaded rubber tires and plated bumper. 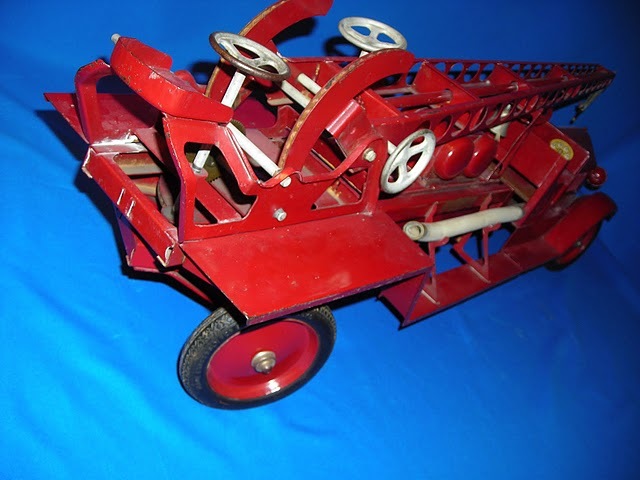 Sturditoy Water Tower other side view showing fire hose and rear steering wheel and wheel crank to raise and lower the tower. Sturditoy Water Tower rear view showing third wheel to move water tower nozzle. Sturditoy Water Tower with rear wheels turned. Sturditoy Water Tower close-up of wheels and crank. 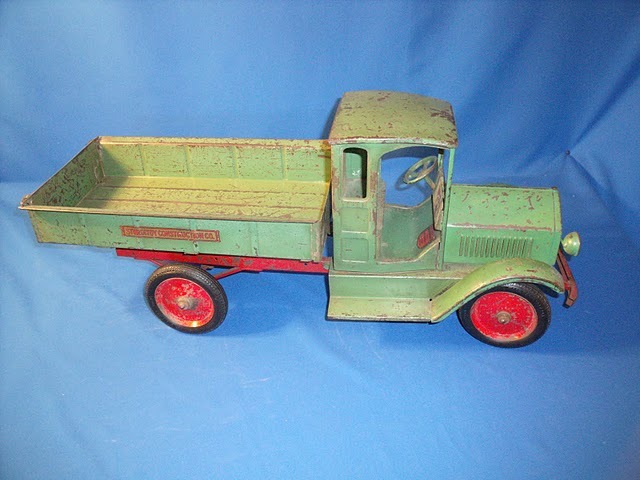 Sturditoy Trucking Company Wrecker Truck: 1929. Headlight bar, 2 headlights, license plate (421), and plated bumper. 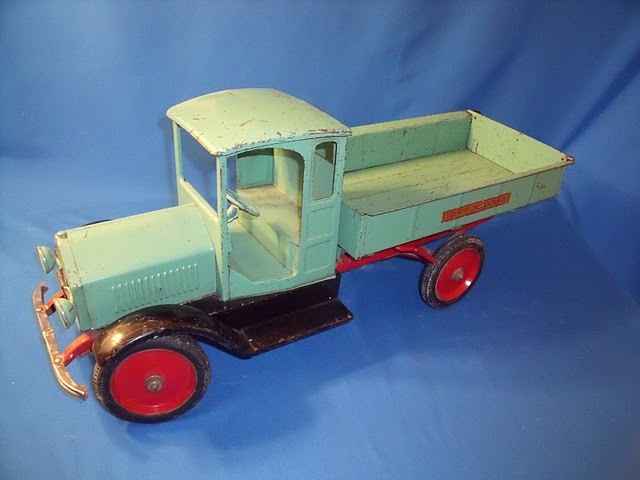 Sturditoy Wrecker Truck Double disc wheels with rubber tires. Sturditoy Wrecker Truck front view of decal, headlight bar and license plate (421). 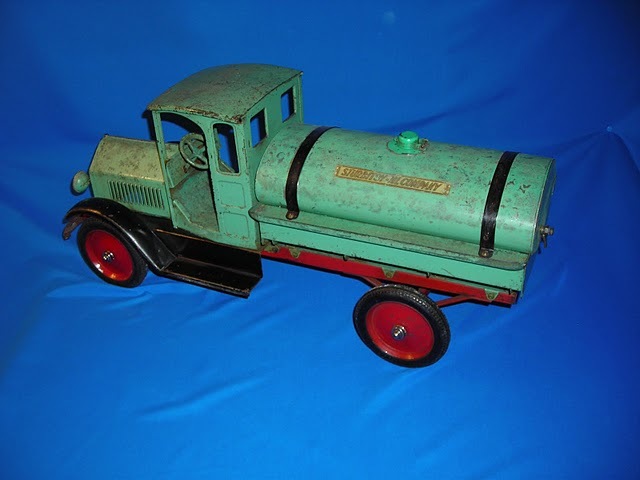 Here at the Virtual Pressed Steel Metal Toys Museum we are always looking to upgrade our collection and are willing to sell toys on this site as well as buy toys as well as trade for toys!